With its cheerful color and festive ruffled edges, double Cherry Nymph makes every day feel like a celebration. We've paired this exquisite amaryllis with our snowflake-patterned, cream metal pot, available in two sizes to accommodate single and triple plantings. 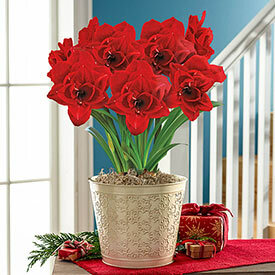 Within a few weeks, the velvety, deep red amaryllis flowers will appear to an appreciative audience. 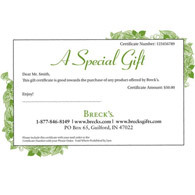 Gifted for Christmas or a winter birthday or anniversary, it's sure to surprise and delight. EXCLUSIVE. Lovely color and easy to grow. This is a beautiful plant and it's easy to grow. I love that it only needs water and sunlight to grow. 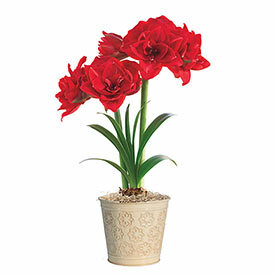 I got this amaryllis as a Christmas present. It's doing wonderfully in my window and will bloom in the next few days. It arrived in perfect condition and was nicely packaged. I was eager to take it out of the box. Will definitely buy again from you. Thanks for adding a little color to my room.